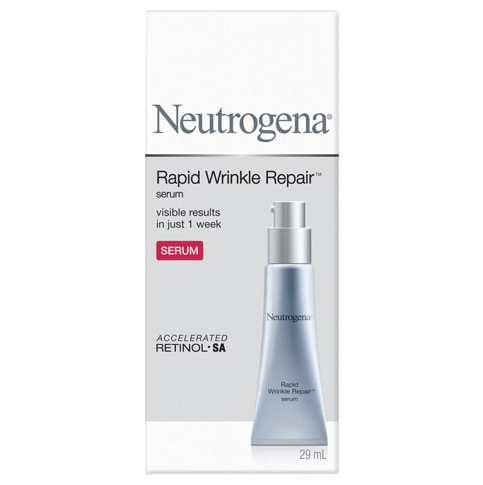 RAPID WRINKLE REPAIR® Regenerating Cream is clinically proven to improve the look of aging up to 5X more than a leading prestige anti-aging serum*. 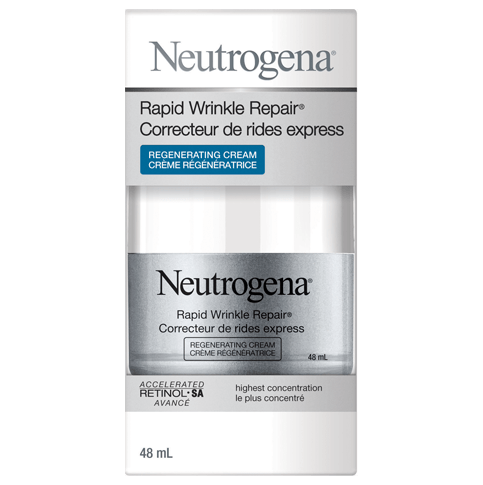 This rich moisturizing cream delivers hyaluronic acid and the highest concentration of Accelerated Retinol SA deep into skin's surface quickly and effectively, to smooth the look of fine lines and instantly plump with moisture rich replenishers. Skin is left looking smoother and younger; deep wrinkles, even crow’s feet, forehead and cheek wrinkles are visibly faded. So effective, 100% of women had noticeable results in just one week. 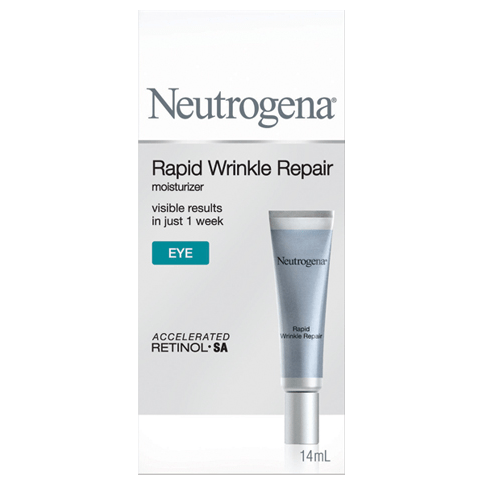 Apply twice daily after cleansing face and neck and after applying NEUTROGENA® RAPID WRINKLE REPAIR® Serum & NEUTROGENA® RAPID WRINKLE REPAIR® Eye Cream. Smooth a pearl-sized amount evenly in gentle massaging strokes until fully absorbed. Replace and tighten cap when not in use. Prior to trying this cream, I had been using Strivectin retinol products for a year. I tried this cream on a whim one day that my Strivectin cream was sold out. So glad I did! This product is just as effective as my former product, but at a fraction of the cost! Don’t be disheartened by reviews referencing skim flaking and redness- it sounds like many reviewers referencing a burning sensation and mild irritation have never used a strong retinol product before this one. All good quality retinol products come with a disclaimer about easing into product use slowly because skim will definitely react and take time to adjust. I experienced the exact same side effects (I have dry skin at the best of times) so I took my dermatologist’s advice on how to apply it. I apply Pond’s face cream, wait two mins and then apply this cream! Works perfectly! No more flaking or burning, but still get great results. Thanks for sharing your review! We'd like to hear more about your experience with our product. When you get a chance, please call us at 1-888-663-8876, M-F 9am to 5:30pm ET. We hope to speak with you soon! This product burned my skin so bad. It didn’t start immediately. It was 4 or 5 days after I began using it. I was at work when my face began to itch and kept increasing throughout the afternoon. By the next day the areas where I had applied the cream were red with dozens of small blisters and an absolute mess. It took over a month before the rash and peeling cleared. It was so uncomfortable and embarrassing. I could not recommend this product. We're so sorry to hear this. We'd like to speak with you to learn more about what happened. Please give us a call at 1-888-663-8876, M-F 9am to 5:30pm ET. We hope to speak with you soon! I bought this to the fine lines on my face. Read the warning that it may cause red skin and slight flaking, but wasn't prepared for my skin to be totally dried out. It was flaking and dry after a few days but since the warnings said this should stop after a few days, I kept using it. Next thing I knew, my skin was constantly flaking off and burning. Everything I put on it would sting. Around my eyes was brutally red and stinging constantly. I always get my eyebrows waxed and when I did, for the first time ever, a layer of skin came off with the wax. I blame this on the cream. It has dried my skin out so bad, it is now incredibly sensitive and weak. Now I have to just wait for my skin to recover from this. In the meantime, wrinkles have been magnified if anything. We're so sorry to hear about the experience you've had with our cream and we'd like to learn more. Please give us a call at 1-888-663-8876, Monday - Friday from 9 AM to 5:30 PM ET. We look forward to speaking with you! I have been using the Hydroboost products, all of them, for a year now. I really like them and have had absolutely no issues with them. But this stuff...ugh! Every time I put it on, I wake up the next morning with breakouts. It is so bad that I am going to throw the nearly full jar out, which is very frustrating, considering the cost. Thanks for sharing your feedback with us! We're so sorry to hear you had this reaction after using our Rapid Wrinkle Repair Regenerating Cream. We'd like to learn more about your experience and help to make this right. When you have a moment, please give us a call at 1-888-663-8876, we're available Monday-Friday from 9a-5:30p ET. We hope to hear from you soon! I purchased this product two weeks ago faithfully use it every morning. I find that if I use it at night and then use it again in the morning my face will feel like it is burning. A mild burning sensation. I have stopped using it at night and only use in the morning and I do not experience that burning sensation. My face does have some sun damage So I am wondering if that is the cause of the burning sensation? I have noticed the fine lines around my eyes are starting to diminish in my face does feel much smoother. I feel like any products that you use that is new you have to give it time to work. I used Noxzema for many years as a moisturizer because that’s what my grandmother did. About six years ago I switched to another facial cream as I was starting to notice fine lines. I decided to try this new product because I am getting older and I’m seeing more lines. Definitely going to give it an honest try. Hi there. Thanks for your feedback! We'd like to hear more about your experience. Please call us at 1-888-663-8876. We're available Monday through Friday, 9am to 5:30pm ET. We look forward to speaking with you! 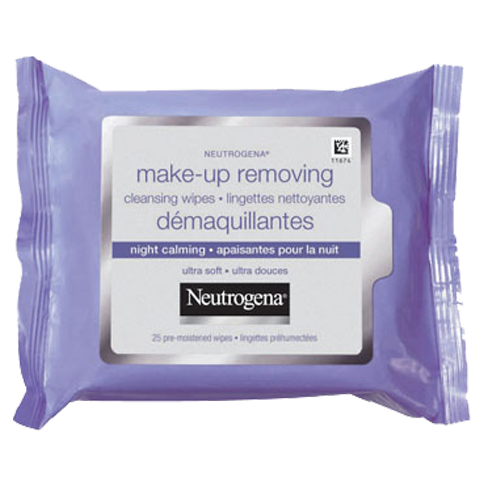 I have been using this product for a week now and I do not see any noticeable difference. You indicate I would see a difference in one week. Times Up! We're sorry to hear that it didn't work out! We'd like to learn more. Please give us a call at 1-888-663-8876. We're available Monday through Friday, 9am to 5:30pm ET. We look forward to speaking with you! We're so sorry to hear about this! We'd love to learn more about your experience with the Rapid Wrinkle Repair line and see how we can help. Please give us a call at 1-888-663-8876 from 9AM - 5:30PM ET Monday through Friday. Thank you! I've been using this cream for 3 weeks and many people have commented on how great my skin is looking. Definitely a great product!